Seattle has suddenly gone full spring, which is entirely the vibe this recipe is on. Part hearty and filling without the meat, part bright and spring forward. It’s a soup that’s something like Chile Verde, it’s also primed to be made ahead and reheated as needed. Scroll down for the recipe, plus check out the photos to see how it goes, and leave a comment with any questions that come up! Turn on broiler and position oven rack at the second highest position. Thinly slice one yellow onion, cut the other onion in half, removing the root end, and rough chop the garlic. 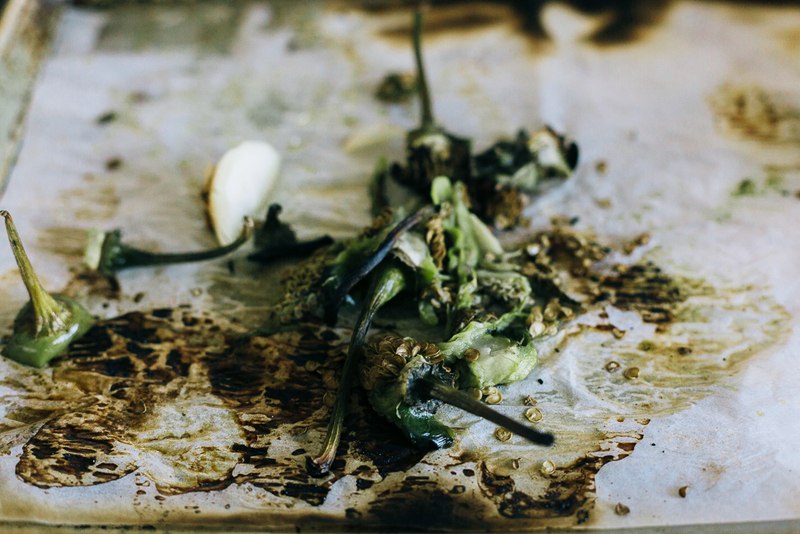 Line a sheet pan with foil and put the two halves of the onion, tomatillos, poblanos, serranos, and jalapeños on top, spread out evenly so it is not crowded. Broil for 5-10 minutes, or until charred. Remove from oven and flip everything over, broil for 5-10 more minutes. Remove and let chill. 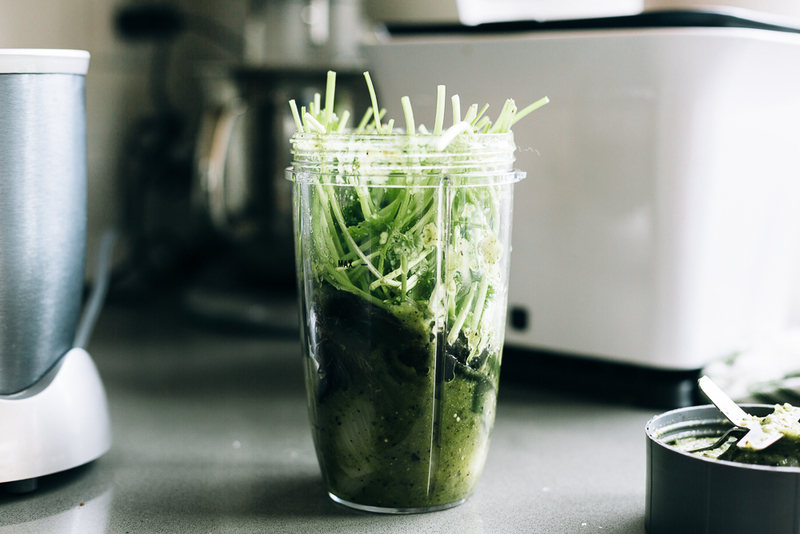 Once cooled, remove the stems and seeds, add all ingredients to a blender (do this in batches if it doesn’t all fit) with the cilantro stems. Blend until smooth. Meanwhile, in a large pot or dutch oven (at least 5 quarts) over medium heat add the olive oil. Add sliced onions, sautéing until lightly browned and aromatic, add the garlic and continue to stir, about 3 minutes. Add the coriander and cumin, stir. Add the green puree, season with salt, and the juice of one lime. Let cook a few minutes, stirring regularly. Add 5 cups of stock. Bring to a low boil, add the quinoa, and reduce to a simmer. Simmer for about 10 minutes with the lid on. Add 2-3 cups more stock, depending on preference. Taste and season with salt, pepper, and lime juice as needed. Add the beans. Continue to simmer for another 10-20 minutes. Add the kale 5 minutes before serving or when reheating.